The cricket is a cousin of the grasshopper. They are better known for their "singing," which is produced by rubbing the back legs together -- which only males can do. Many civilizations, including the Chinese, have kept crickets as pets for thousands of years. If you are thinking of joining them, there are a few things you need to do in advance to get prepared. In order to keep crickets safe -- and prevent them from escaping -- you need either a plastic container or an aquarium. Cages are out of the question. You'll also need a lid that's either made of fine mesh or plastic with small holes that are big enough to allow for air circulation, but too small for the crickets to slip through. Cover the bottom of the container with either sand or soil and then add rocks, artificial plants and a few hideaway places, such as empty toilet paper rolls. In the wild, crickets are opportunistic eaters. That means they'll eat pretty much whatever they can find, both from the plant and the animal world. For example, you can feed your pet cricket small pieces of fruits or vegetables, but you can also feed him oats or other cereals. Birdseed is also a good option. Crickets also need a small bowl filled with fresh water on a daily basis. While crickets can survive lower temperatures, they are at their happiest around 86 degrees Fahrenheit. When the temperature drops lower than that, they might become less active and don't "sing" as much. To push the heat up, get an electric lamp -- the kind used to warm up lizard cages. Another option is to put a heat pad or a hot water bottle into the cage. 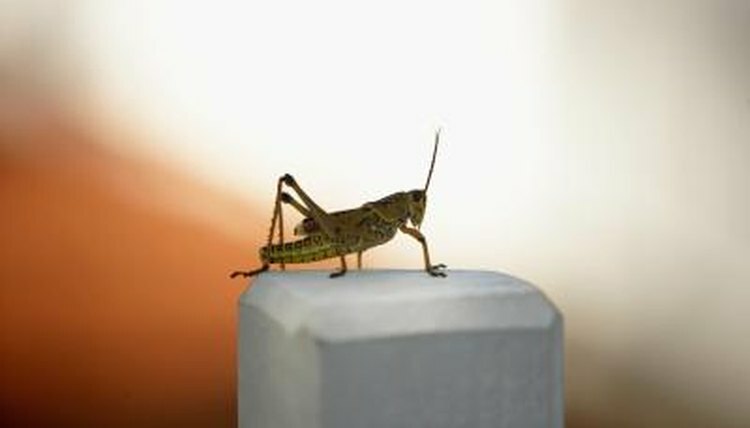 Crickets don't live very long -- 2 to 3 months is the average life span of a pet cricket -- so you might find yourself getting a new one several times a year in order to keep the aquarium occupied. Also, keep in mind that crickets that are not well-fed might end up attacking and trying to eat each other, so don't forget to offer food every day. What Do Crickets Do to Protect Themselves?